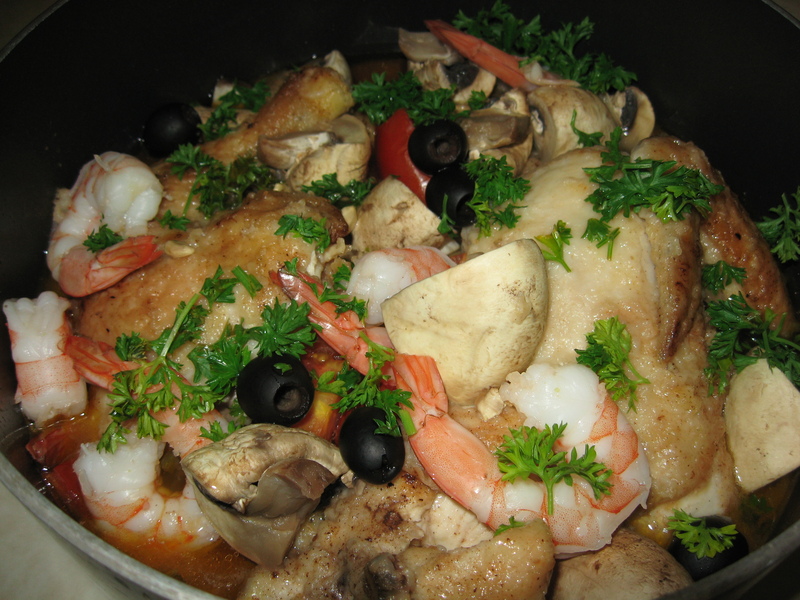 Chicken Marengo Recipe #2—A More Authentic Version? Once again, I am telling the historical tale of this dish because I think it’s so cute and the outcome is so delicious. Napoleon and his traveling chef, Dunand, were the men who made this dish famous. After the battle at Marengo (Piedmont, Italy), Napoleon demanded from his chef a quick meal—imagine this after a treacherous journey over the Alps in mid-May. Cooking legend has it that even in these hinterlands, Napoleon’s forever challenged chef found a chicken, tomatoes, onions, garlic, herbs, olive oil and crayfish. He cut the chicken up with his “saber” and made a dish very much like this recipe. Reportedly being thoroughly French, Dunand also added a dash of cognac from Napoleon’s flask. Napoleon liked the dish immensely and since he won the battle, considered Chicken Marengo lucky. So he asked for it often just as Dunand had originally made it. My other recipe is a bit less time consuming to make, however, this one is really excellent and worth the time spent. This dish will be cooking for a total of 1 hour—stove top. In a paper or plastic bag, shake the flour with the S&P and paprika; when well mixed, introduce your chicken pieces into the floured bag. Shake vigorously so that the pieces are floured evenly however not heavily—they need to be “lightly” doused. In a large heavy pot that has a good lid and on an oven top burner (medium-high heat) bring the oil and butter and some of your minced bacon up to a nice light sizzle (remove the bacon with a slotted spoon); introduce your chicken pieces into the oil/butter and turn the heat down to the point where your pieces are browning evenly, turning frequently, and are not burning. Golden colored is what you wish. Don’t crowd them so it may take several sessions to do this. As well, I would say it might take 2-3 minutes per chicken side to get them brown just right. Set them aside on a platter. Now, introduce the remainder of your bacon plus the set aside bunch and in the remaining oil, etc. in your pot, brown the veggies mentioned in ingredients 6-9. When they have softened somewhat (3 minutes or so) introduce the major portion of the tomatoes, however save about 1/2 C. for later); let the mixture simmer for another 2-3 minutes. Reintroduce your perfectly browned and golden chicken pieces along with your Bouquet Garni. ;over all, pour your brandy/wine combo and let simmer very gently on stove top for 30 minutes— tightly covered. After 30 minutes, place the additional tomatoes on top (don’t stir but make sure that you have enough liquid collected and taste to see what you think); simmer gently, tightly covered, for another 25 minutes. For the last 5 minutes, top the dish with the poached shrimp and mushrooms and add the chopped and whole olives. Simmer well covered once more. Make sure the chicken is done (I’m sure it will be and FINIS—Napoleon would be delighted). Before serving (don’t forget to remove your Bouquet Garni), top everything with freshly chopped parsley, give a hearty squeeze of fresh lemon and there you are. Additionally, if you wish, you can place toasted croutons on top. Sometimes it’s fun to make your own shaped croutons (1-inch diameter) for a dish as this. This goes very well with rice and a light salad. Sounds like a simple peasant dish doesn’t it? Well, after you’ve made and served this, you’ll say: “I don’t think so” or maybe you’ll say “Peasant dishes are the best!!”. As always, from Margot, Bon Appétit.